Just as a family is not complete without love, a home is not complete without a warm, family friendly kitchen. It is the place where food is cooked and shared, where thirst is quenched and where hungry tummies are fed, it's the hub of the house and home to tea and cookies as well as Sunday morning fry-ups. A kitchen is where it all comes together. Which is why it should be a warm, comfortable place in the home, fit for the whole family. With soft colours, the right appliances, cushy seats and a few touches here and there, a kitchen can become a place that every family member will want to be in, which means plenty help with the cooking! Turn your kitchen into something out of the pages of a design magazine with a few simple tips. The breakfast bar is the solution to rushed mornings before school and quick dinners in the evening, bringing the family together right in the comfort and warmth of the kitchen. The proximity to the kitchen is also fantastic for those days where Mom or Dad is busy in the kitchen but needs to keep an eye on the kids so that they eat all of their fruits or vegetables. It also means that the kids aren't sneaking off to eat their cereal in front of the television. Additionally, breakfast bars can be a stylish extra to any kitchen. 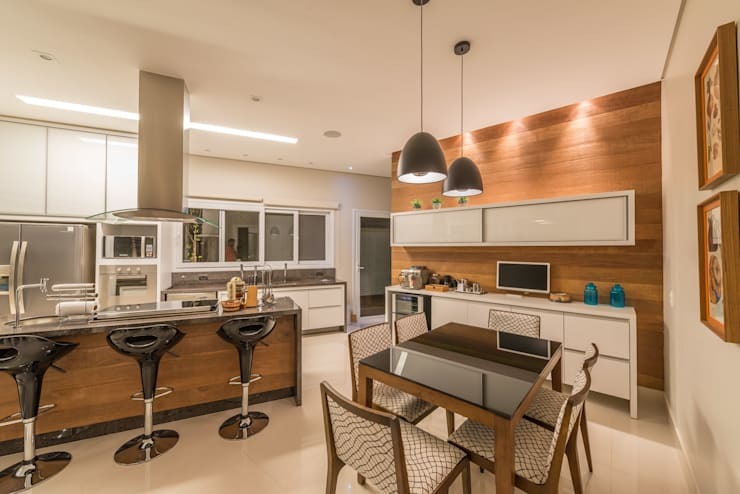 This one, by Maria Christina Rinaldi Architects in Brazil, mixes up the look and feel of the kitchen adding a lighter wood and a new design element. Paired with trendy high stools and it's a stylish accessory to the kitchen in itself. If space is too limited to include a brand new breakfast bar, position a few bar stools along the outside of the kitchen counter to create your own. 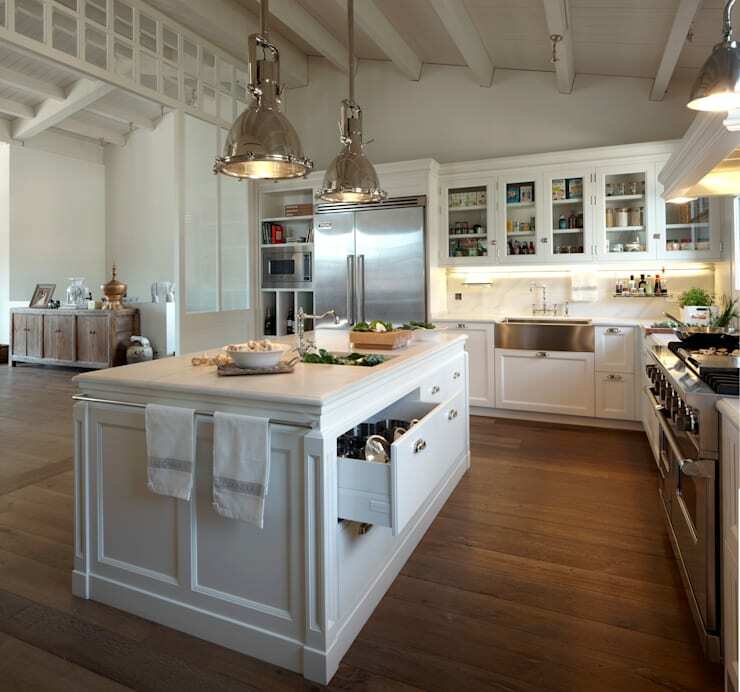 An island is a functional addition to a kitchen, adding storage space and extra surface space to the room. It also fills an often open-plan space, making the kitchen warmer and more cosy. Notice how this island includes a lot of drawer space, adding extra room for pots, pans, plates and other kitchen crockery. A handy rail on the left provides space for dish towels. The island surface slab offers an extra area for chopping, stirring and preparing. An island also makes a kitchen a more social space to be in. Guests have a place to put down their glasses of wine, roll their sleeves up and help with the cooking and kids have a place to sit and catch up with Mom and Dad while they are busy in the kitchen. Opt for an island that complements the rest of the kitchen's style, with either a bright, funky colour or a neutral tone in line with the rest of room. Granite counter tops are also a gorgeous addition to any kitchen and can be used on an island, which is a good surface for chopping and preparing food on. A kitchen table can make or break a kitchen. Size is a huge factor here as a kitchen shouldn't be too crowded or cluttered. But with the right sized-table, a kitchen can be transformed into a homely hub for the family. 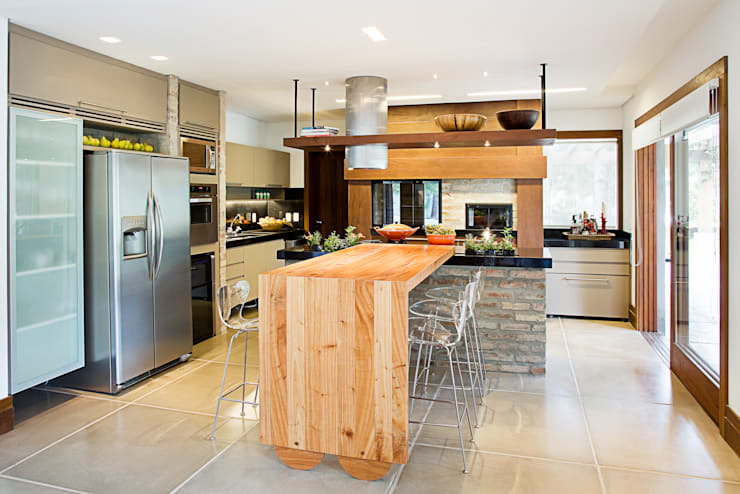 Wooden tables always add incredible warmth and light to a kitchen with its often steel or black appliances. 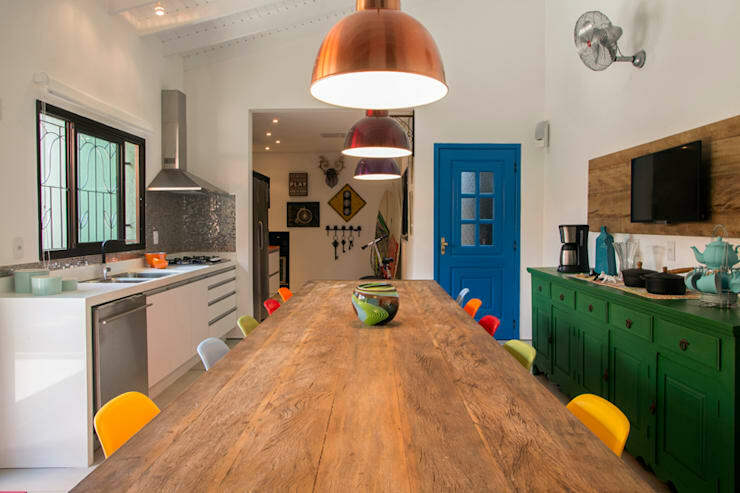 Paired with colourful chairs and the kitchen becomes a stylish room to rival any other in the house. If wood isn't in-line with the style of the home however, there are many other options. Go for a glass table or a table that is painted to match the colour of the kitchen. You can even get the whole family involved in painting the table one weekend from the sanding down to the choosing of the paint to the varnishing. Kitchen tables are also where the family comes together so it shouldn't just be a décor item, it should be a piece that is used often. Place fruit bowls, vases of flowers and candles on it to add ambiance and that extra touch so that the family want to sit around it. Get inspired by this kitchen product range. While not a traditional addition to the South African kitchen, a sofa is the modern equivalent of the age-old 'stoep'. A sofa adds a new level of comfort to the kitchen space where the family can curl up together while the stove is sizzling. It also provides a great place for an informal, plate-on-your-lap Sunday night meal. Sofas also provide an opportunity for some really fun and trendy design. Check out this Vintage Sitzbank Taxi Front Sofa, made from recycled materials. 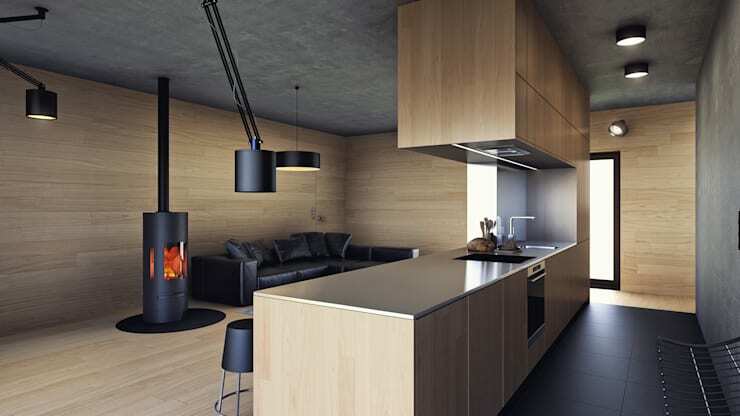 Size, style and material can all be decided on depending on personal taste and the design of the rest of the kitchen. If a more neutral coloured sofa is the aim of the game, then spruce it up with colourful cushions and soft throws. In winter, it's the perfect place to huddle under the blankets with hot chocolate, sharing stories about the day. Sofas also take the often hard-edge of kitchens, softening the look and the feel. A family friendly kitchen is an open plan kitchen. Long gone are the days of the cut-off, isolated kitchen hidden somewhere at the end of the house. Today, the kitchen is often the centre of a home where the whole family can come together. Design-wise, it is just as important as the rest of the house. The biggest advantage to an open plan kitchen is the ability to multi-task. Parents can cook, clean and prepare while talking to their children, testing them on their homework and keeping an eye on them. 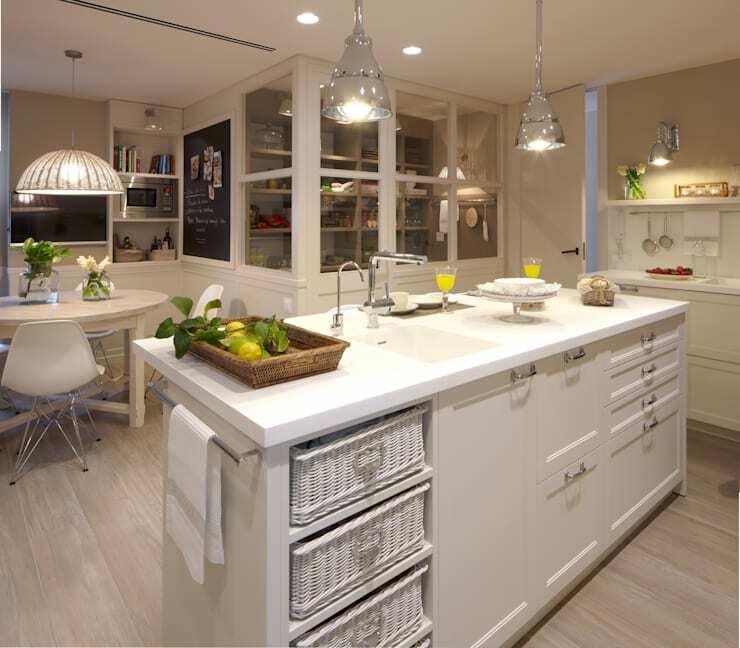 Open plan kitchens also represent a more casual home where guests too can talk to the chef during the cooking process. Even if the house is small, an open plan design can work beautifully, giving the impression of a larger space. If your kitchen is smaller, read these 10 Tips To Make Your Tiny Kitchen Sizzle. As families spend more time in kitchen, many are opting to include a television in this space. The kids can enjoy their afternoon cartoons or Mom and Dad can enjoy the morning news, all while working preparing lunches, cooking dinner or making breakfast. Design-wise, televisions can make a sleek and modern addition to a kitchen. Position it in a central spot that won't get in the way of cooking and opt for a larger screen if possible. Television stands and cabinets can be just as important as the television itself. There are thousands of stylish options out there, which can add a touch of glamour and glitz to the kitchen space. See these incredible television features from this home media design and installation company, Loewe Technologies GMBH, based in Germany. Some feel that a television is a distraction in the kitchen so it's also up to personal taste and style. Family communication doesn't have to be a few tired words over breakfast. Use fun designs when it comes to notice boards to add something creative to the kitchen space. This wall-sized black board, designed by Polish architects Indea, is the perfect notice board design. The kids can use chalk to draw and write, while Mom and Dad can share notes and reminders in one, central space. This kind of board also adds a more casual touch to the kitchen space, showing that it is a family home through and through. If a ceiling to floor notice board isn't the right style for the home, use smaller chalkboards shaped in hearts, circles, squares or rectangles. Another option is funky, colourful paper notepads that can be stuck to the fridge. White boards are also often used in kitchens as notice boards. As long as the family has a fun way to pass messages to each other, notice boards can add a bit of colour to any kitchen. There are so many ways to make the a kitchen family friendly and it can be an enjoyable, creative experience for the whole family. Have these tips inspired you to make changes to your kitchen? Let us know in the comments, below.